Love the Bradley Smoker. I'm on my second version (I wore out the 1st, Bradley Original, and have gone to the 4 Rack Digital). Before the Bradleys, I used an offset barrel smoker. The one downside of the Bradleys is the dimensions of the smoking chamber. Smoking a whole Whitefish was/is one of my specialties. A whole Whitefish (24"+) just doesn't fit onto the Bradley racks (15" x 11"). The presentation for holidays and parties was always a hit. Here is my solution. When the fish is dry, run the "S" hook through the mouth. Anchor the bottom hook (larger end) into the backbone of the fish. This will support the weight of the fish during the entire smoking duration. I've read several posts where the individuals attempted to hang the fish from the tails..which always seem to pull off during smoking. Remove the horizontal racks and hang the fish from the variable Damper at the top of the smoker. When hanging from the Damper (in the wide open position), the "S" hook renders the Damper inoperable. I solve that by using terracotta feet (used for pots). These can be manually adjusted for any flow rate. When the fish is smoked to the desired doneness, unhook from the Damper and prepare for the presentation. Finished product! I usually surround with a bed of parsley. That has to be sooo good. Looks fantastic! 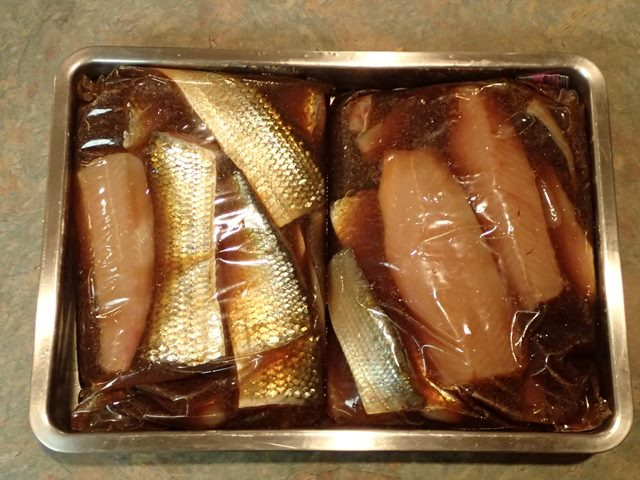 Before we start...I have 2 versions of "Smoked Whitefish"
Brine: A bottle of red wine (cheap bottle of red zin (big sugar), 1.5 cups kosher salt, 2 tablespoons peppercorns, 3 bay leaves, 2 tablespoons mustard seeds. 5 qts water. Mix all ingredients, in a large saucepan, and heat until the salt is completely dissolved. Add ice to cool down mixture (cool to the touch). Add fish and soak in brine, in the refrigerator, for 4 to 6 hours. .
Dry fish: Let 'air dry" in the refrigerator for 3 to four hours. Smoke for 2 to 3 hours at 220°, I use alder wood for most fish recipes. Smoking lake whitefish whole, including the head, seems to be a tradition in some parts of the country. But I prefer to fillet my whitefish, cut the fillets up into portion-sized pieces, and vacuum pack and freeze the pieces after they have been brined and smoked. The brine gets into the meat better, the smoke gets into the meat better, and I can defrost an amount which I can eat in a week or so. Whitefish have thin meat next to their rib bones, and thick meat above their rib bones. After I remove the rib bones from whitefish fillets, I cut off the meat which was next to the rib bones, which produces a long thin strip and a long thick strip, and I cut each strip in half. Then I brine and smoke the thin pieces for shorter periods of time than the thick pieces. By doing this, the thin meat next to the rib bones doesn't get too salty or too dry as a result of the brining and smoking times required to produce good results with the thicker meat portions of the fillets. This particular batch of whitefish was brined with Kummok's wild smoked salmon brine recipe, with the salt content increased to adjust the recipe to 60 degrees salometer. I adjust all of my brine recipes to this level of saltiness because it helps me produce consistent results with a variety of recipes and with a variety of kinds of fish. 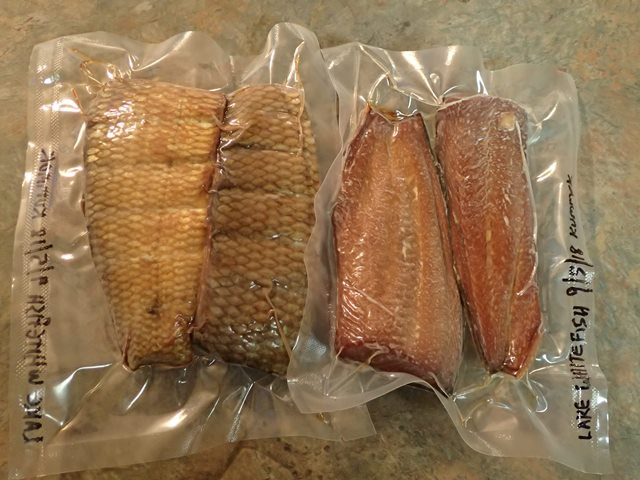 For example, I have learned how long to brine 10"-12" kokanee fillets, pieces of fillets from 20" whitefish, and pieces of fillets from 26" lake trout with a 60 degree salometer brine, and the same brining times work with a variety of recipes which I have standardized at that level. 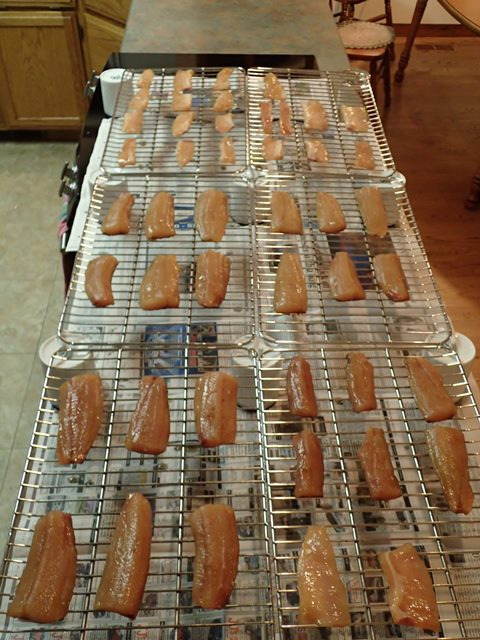 Some pictures from a recent batch of smoked whitefish are shown below. Edward176, I grew up in NW Ontario, and we smoked a lot of Northern Pike, Lake Trout. You can also make pickled Northern, same as you would herring. It's quite good. Give a man a beer and he'll waste a day. Teach him how to brew and he'll waste a lifetime. Page created in 0.071 seconds with 22 queries.